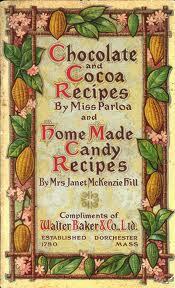 Chocolate and Cocoa Recipes and Home Made Candy Recipes are co-written by Janet McKenzie Hill and Maria Parloa Compliments of Walter Baker & Co., Ltd. The book depicts on the various preparations with Chocolate or Cocoa. The valuable part of the book are the various "Medicinal Values", that Cocoa offers to all of us and rightly supported by Physicians with their observations and researches. The term "Cocoa," a corruption of "Cacao," is almost universally used in English-speaking countries to designate the seeds of the small tropical tree known to botanists as THEOBROMA CACAO, from which a great variety of preparations under the name of cocoa and chocolate for eating and drinking are made. The name "Chocolatl" is nearly the same in most European languages, and is taken from the Mexican name of the drink, "Chocolate" or "Cacahuatl."